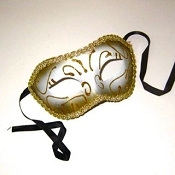 Decorated on a half mask form and painted silver with opalescent sequins around the eyes. 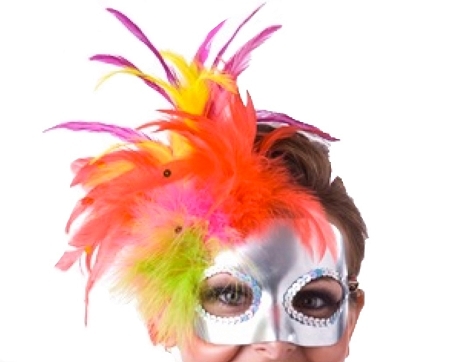 Coming out of the right corner of the mask is a combination of Turkey marabou fluff, Rooster hackles and Rooster Schlappens in fluorescent yellow, hot orange and shocking pink. Feathers have been accented with sprinkles of opalescent sequins. Overall size is 8 to 9 in high by 10 in wide.